Troy Gymnastics is hosting a Mom 2 Mom Sale on November 13th, 2016 from 9:00 a.m-1:00 p.m. There will be 50 tables set up of merchandise for you to stock up on fall and winter wear for your littles! The Allergy Table will be hosting a table at this event to give the community an opportunity to purchase our allergen friendly goodies in small sample sizes and learn more about our Bakery! If you’ve heard of us and haven’t placed an order yet come on out and taste our treats for yourself! We will have donuts, cookies, cupcakes, baked sweet breads, and so much more! You can also enter our drawing to win a free donut tray for 12. How cool is that? Troy Gymnastics has allowed The Allergy Table to provide our allergen friendly treats/goodies at this event to help raise awareness for food allergies and promote our new bakery. No other food vendors will be allowed to set up at this event…we will be the only one! Let the kids burn off some energy and play in the open gym area. If you have never been there before the first time is free. All you need to do is fill out a waiver form when you get there. 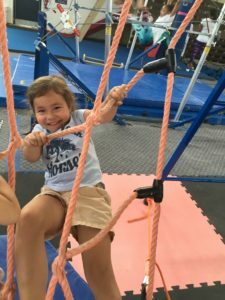 They can enjoy utilizing all the gymnastics equipment such as trampolines, climbers, balance beams and rope wall. We Deliver right to your event or Home! Our Company is backed by a board certified Allergist right here in the community who believes in what we do! Over 15 million Americans have food allergies and this deadly disease affects 1 in every 13 children (under the age of 18). That’s 2 kids on average for every school classroom. Yikes! Food Allergies among children have increased 50% between 1997 and 2011. So Come on out and see what all the fuss is about! Sunday November 13th, 2016 from 9:00 a.m. to 1:00 p.m.
Rochester Hills, MI, September 23, 2016– Check it out Folks! 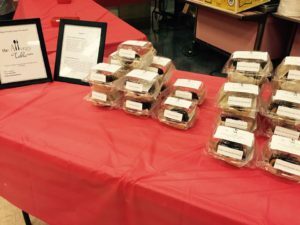 The Word Is spreading and we are one step closer every day to allergen friendly alternative snacks at every school function! The Allergy Table was happy to offer Allergen Friendly Donuts at Brooklands Elementary School’s Fall Family Festival. We set up our “Allergy Table” with two different kinds of donuts for children to choose from. This was a test market event to see how the public would respond and guess what? We sold out before the end of the event! Stay posted to see which event we will be setting up our “Allergy Table” at next. It was such a wonderful surprise to an allergy food option served at the Family Festival night. My daughter (who has multiple food allergies) was able to partake in ALL of the school offerings at the Fall Festival instead of skipping the food and snack area like we usually do. A Huge thank you to THE ALLERGY TABLE for making that possible! If you would like more information about this topic, please contact Jennifer Plumer at The Allergy Table or email at theallergyTableinfo@gmail.com.